Community Contributions: The Dauphin Island Sea Lab appreciates the continued support of the community. 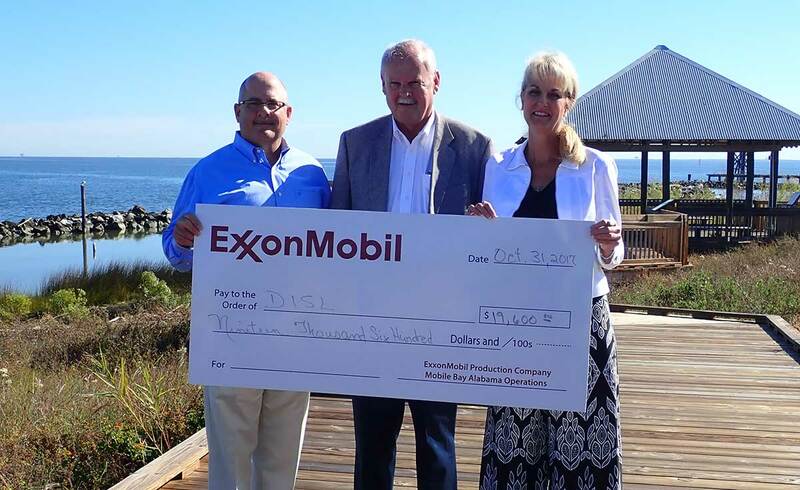 For more than 20 years, ExxonMobil has supported DISL with an annual contribution. This year's nearly $20,000 donation will go to support University Programs, Discovery Hall Porgrams, BayMobile, and DISL's Graduate Student Association. The Port City Pacers shared the proceeds from the Hurricane Run with the Dauphin Island Sea Lab's Discovery Hall Programs. DHP Chair Dr. Tina Miller-Way said the $1,500 donation will support scholarships for the summer programs. Estuaries and Coasts: University Programs Chair Dr. Ken Heck will be the New Reviews Editor for the Estuaries and Coasts Journal beginning in 2018. Boardwalk Talk: The Estuarium at the Dauphin Island Sea Lab will host only one Boardwalk Talk in the month of December. Meet Dr. Kelly Boyle on Wednesday, December 6, and learn more about how scientists in the field of bioacoustics use recording equipment to study the behavior of animals by listening to them underwater. The talk begins at 11:15 a.m. and is free to the public. Holiday Giving: The Dauphin Island Sea Lab Foundation invites you to share the gift of environmental stewardship this holiday season and consider donating in honor or memory of those on your holiday list. The Dauphin Island Sea Lab Foundation promotes and supports the Dauphin Island Sea Lab in its vision to seve as one of the nation's premier marine environmental science labs and edcuational institutions. The recipient of your choice will receive a holiday card notifying them of your gift to the Dauphin Island Sea Lab on their behalf. If you are interested in donation, you can make a donation online or download the form by clicking here.